RANTWICK - Commuter Cycling in London Ontario | A Bike Blog: %^&*$! Powerlink! My "new" commuter was built using a SRAM chain, which includes a Powerlink, a special link in the chain that is designed to come apart when you push the bushings together from both sides of the link, making removing the chain for cleaning "easy". I chose that chain largely because I am a lazy person when it comes to caring for my chain. I never squeak, because I lube the chain quite often, but I clean it way too infrequently, and I thought it might help me mend my evil ways. I did get around to removing the chain for a proper cleaning sooner than usual. I struggled with that powerlink for something like twenty minutes. I fashioned a link squeezer tool from a spoke... no dice. Eventually I caved in and did the equivalent to asking directions when you're lost; I checked online to see if others had been having the same problem or if I was just stupid. Yes, I do work on my bike while wearing business attire. Business attire is the only clothing I have, because living my life is my business, and I figure I had better dress accordingly and toe the line. 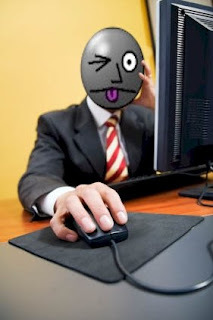 I don't want to get fired from living my life! The only alternative would have been to work on my bike naked, which is not recommended while working on a fixed gear. So, anyway, I wanted to know if I was just stupid or whether anybody else had been in the same position. It turned out that as with so many things, it was a little of both. Other people had also struggled. I needed to squeeze the side plates together while doing what I had already been doing, which I should have figured out. I got that sucker apart eventually, but even with that extra information, it wasn't easy, and my homemade tool came in handy. I don't remember any instructions coming with the chain. I remember experimenting with the link, and of course it worked fine when perfectly new and clean. 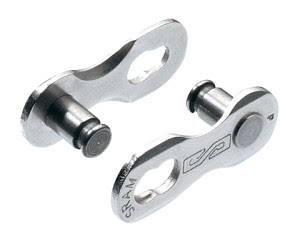 SRAM is a very popular brand of chain. Up until this one, I had been using Shimano. Just the same, I feel a little sheepish that as a "mature" cyclist and newly-minted builder of bikes I couldn't figure this out on my own. When I'm feeling insecure, nothing helps like asking a bunch of strangers on the Internet to opine on whether I'm a loser. So, if you have any experience with Powerlinks, please respond to the following poll! If you answered "a", you're just a big mean jerk face, and I don't like you. July 6, 2009 Follow-Up: I took the chain off for cleaning again yesterday. I had that thing apart in less than 10 seconds. After all that initial frustration, I now officially like Powerlinks. The first time I was taking one apart, it was one of those times I ended up getting grease on my keyboard as I turned to the internet in despair. Despite being less intuitive than it seems like they should be, I still prefer them to Shimano's snap-off pins. I bought the Park special link pliers. Seems like a pricey gadget, but nothing else works as well. And anything is better than a Shimano chain. But Shimano chains smell the nicest when you open the package. I often sneak into bike shops, rip open all the Shimano chains and smell them, and then sneak out. Wipe that one link section down really well. Wiggle the link like you would wiggle a stiff link to loosen it, and then with one zen like squeeze, the two together and twist apart. Works every time most of the time. I agree that there is a finesse point to doing this, but the alternative I suppose would be looking over your shoulder at your chain laying in the street as it had prematurely released itself. Nick - especially now I know how to get the little bugger apart, I definitely prefer them too. Cafiend - I thought I was the only one who like the smell of bike chain in the morning. Crank - I have hogh hopes for a more zen like experience next. Thanks all for commenting, and have a super weekend. Same dilemma! Before I found the same solution as you, I used an el cheapo, Made by the C.H. Ina tool company, "F" connector coax crimper. The diameter of the connector is the same as the Powerlink. If memory serves, beers may have been a contributing factor to my frustration and incompetence. Thanks for dropping by, Lemming. I had a similar experience recently when I cleaned my chain. I struggled with it for a while, then read about it online and realized I needed to squeeze the sides in. After that, it worked pretty easily and I did feel sheepish about all the effort I'd expended. Sheepish - good word. I like my powerlink now. Thanks for visitng, Jim!